ATTLEBORO, Mass. - Those already crowning BC High the foregone Division 1 south sectional champion may want to rethink it. On Monday night, Mansfield (15-2) picked up their eighth consecutive victory with a come from behind 66-56 road win over Hockomock League rival Attleboro. The Hornets were paced by point guard Christian Weber’s 18 points to go along with forward Sam Goldberg’s 16 points. Mansfield, who was without sharpshooter Tyler Boulter due to a foot injury, was able to pick up a key contribution from Ben Albanese. Albanese (13 points) poured in three baskets from beyond the arc to go along with a pair of buckets around the rim. Hornets coach Mike Vaughan said Ben Albanese’s performance showcases the team-oriented style of basketball that Mansfield plays. Midway through the third quarter with Mansfield on top 43-40, the Blue Bombardiers (10-7) put together a 7-0 run to grab a four-point edge. 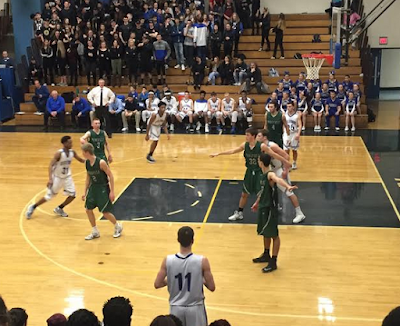 Jake Dunkley started off by drilling a game tying three from the corner, and Bryant Ciccio (14 points) and Nate Douglas knocked home consecutive layups to hand Attleboro a 47-43 edge. Goldberg, however, helped bring the Hornets back before the end of the quarter as a mid range jumper to go along with a put back helped Mansfield draw even at 49 heading into the final stanza. The fourth quarter was all Mansfield. After seeing the Hornets change to a 2-3 zone for the last eight minutes, Attleboro found itself stuck in the mud offensively. At the other end of the floor, Mansfield finally started to create some open looks from the three-point line. Albanese drilled his fourth of the night from the left wing to give Mansfield a 52-51 advantage and moments later Weber and Max Boen drilled back to back three pointers of their own to hand Mansfield a four point edge. Attleboro was never able to regain its footing. Over the final three minutes of play Mansfield in all went on a 14-0 run, holding the Blue Bombardiers to an 0-for-5 mark from the field while forcing three turnovers to close out the victory. In the early going it was Attleboro who landed the first punch as four different scorers propelled the Bombardiers to an early 8-2 edge. Phil Vigeant hit a three pointer late in the opening frame to help Mansfield weather the early storm and get them back within 14-12 after a quarter of play. The second quarter belonged to Attleboro point guard Bryant Ciccio. Throughout the evening Ciccio tortured Mansfield, often crossing over into the lane and then hitting 12-foot jump shots. Ciccio’s skills were on full display in the second quarter, scoring 10 points including six in a row at one point. Mansfield’s offense refused to be phased by Ciccio’s dramatics as Vigeant and Albanese combined for four three pointers in the frame to help Mansfield build a 33-30 lead at the break. The Hornets have reached the south sectional semi-finals for each of the six seasons, and with the way they are rolling right now there is no reason to expect this season to be any different.